When it comes to change, I’m not a fan of it. If I find a race worth doing then chances are that I stay loyal to that race and will more than likely participate in it every year. The Knoxville Track Club hosts a fantastic 5k race every July 3 since most people have the next day off of work. It is flat and fast down Neyland Drive and starts at 9pm. The late start can be a huge damper for some people but I really don’t mind. The only downside is the heat/humidity and the hot asphalt. The past few years the heat has been exhausting. Knoxville has been having some crazy weather lately and I was a tad concerned for my new shoes when the radar showed a 100% chance of rain and thunderstorms for race night. 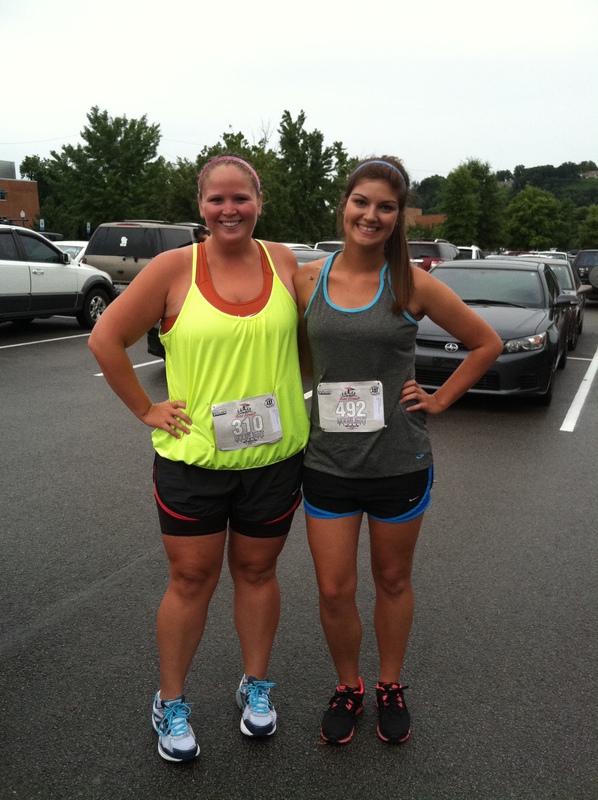 Ashley signed up to do the race with me and we both made the decision to run it regardless of weather. Parking can kind of be a hassle at this race so we made sure to get there an hour early and it worked out great for us. We were able to find indoor bathrooms with NO lines (you’re jealous, right?) and found a nice little hallway to get some pre-race stretching in. 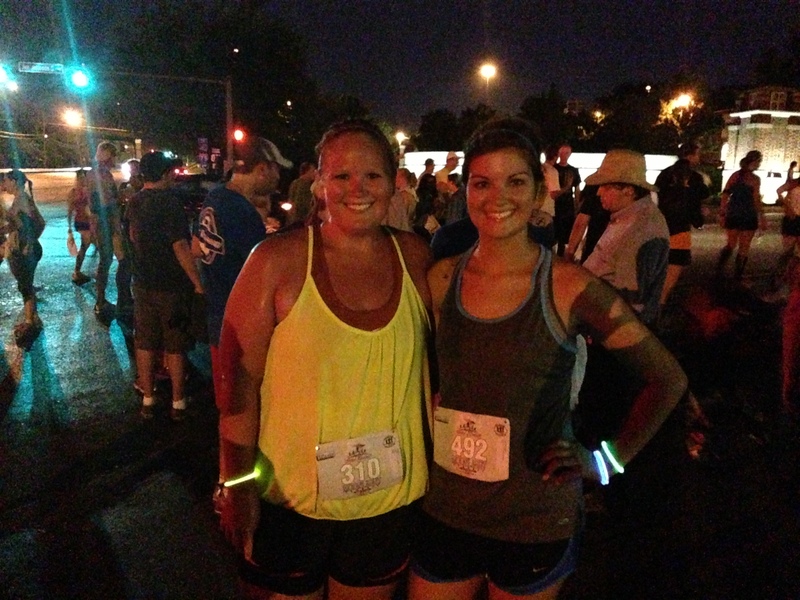 Ashley’s coworker ran the race too and she got us glow sticks to wear on our wrists! They took me back to Hood to Coast and all the glow stick memories. It was really crowded at the start but I just got as far left as possible to avoid any potential bobbing and weaving and so I would be out of everyone’s way. The gun went and we were off! While I had no official goals for this race, I wanted to set a 2013 PR which would be anything under 34:10. I wrote paces on my arm for a finish of 32:30 and tried to come as close as possible to it. I went out slow and steady and just tried to focus on myself and not any of the other crazies around me. I made it just past the one mile marker before stopping for a walk break. There is a long downhill, but not steep, grade before the turn around since it is an out and back course. I made sure to run down the hill to make up for any time I would lose by having to walk up it. I saw lots of people I knew who were on their way back and it was fun to yell and cheer for each other. To my surprise I was able to make it up more than half of the hill before walking. I started running again after the second water stop and my belly started to ache a tiny bit so I just pulled my spandex off my stomach and that offered some relief. Around 2.2 miles I took a walk break then told myself I was going to run again until I got to 2.75. Mentally, that was really hard for me. I was hot, but I was cold, I was tired, but my breathing was fairly good. There was a lot of opposing forces going on in my brain. 2.75 showed up on the Garmin and I told myself if I stopped running then I wouldn’t meet my goal. So I just kept on. The finish line came into sight in the distance and unfortunately I could not dig deep enough to “kick it in” but I still continued to run through it. My boyfriend was at the start of the finishing chute cheering and clapping and I wish more than anything that I could have sprinted through the line but I was running and that was enough for me. can you see the glisten on our skin? 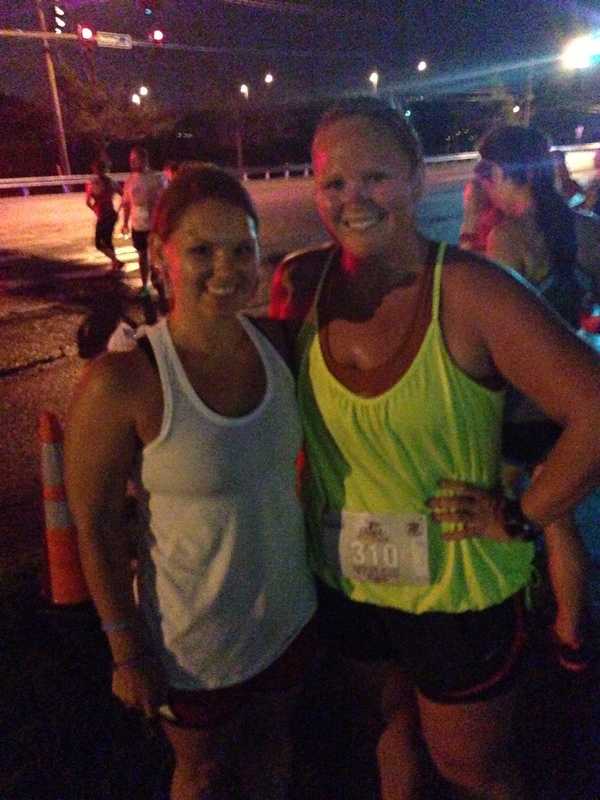 At the finish line I found Ashley and we squealed with excitement over meeting our goals. I finished more than a minute faster than my fastest 2013 5k. Ashley ran a 30:57, close to 4 minutes off her time at Cove Lake 5k just two weeks ago. We were so happy! My sweet friend Brittney also found us since she had been volunteering for the pre-race festivities. I was so excited to see her and gave her a huge hug, obviously forgetting that I was sweaty and stinky. Hope she didn’t mind. We stuck around for a little bit of the awards knowing we wouldn’t win but secretly hoped our numbers would be called for some awesome door prizes! No such luck. TJ’s friend Zach came to watch Ashley run and they suggested we go back to Zach’s pool to cool off. Best idea ever. Nothing like going for a midnight swim in spandex and sports bras after an amazing race! Brittney loves when her sweaty friends hug her! This race was mentally tough for me but I’m proud of the way I handled it. I came out with a 2013 PR in a tough race and pushed through it. Currently I am on the lookout for my August race and I’m really hoping I can find one and knock off my next big goal! This entry was posted in Race Recaps and tagged KTC race, Pilot Fireball 5k race, race recap, running with friends by thegogirlblog. Bookmark the permalink. Sounds like you had a great experience!! Nice job! Way to go on a great race!!! Can I ask a dumb question? I’ve seen others mention the athena division… what’s that?